What is the ideal "warm edge" spacer system? This is revolutionary composite laminating technology. Duralite actually combines five components into an integrated, flexible "warm edge" system. Duralite has been rigorously tested and proven effective in use to EN 1279, Part 2, 3, 4 & 6. A system that makes manufacturing faster and less costly, while also improving commercial opportunities. 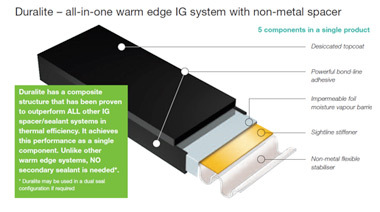 A system that helps make IG units more thermally efficient with improved performance ratings. A system that helps maximize visual quality and durability of their windows and reduces their energy costs - making a positive environment contribution. The only difference between Duralite and Duraseal is the material of the flexible stabilizer of the glass spacer. While in Duralite /please, refer to the diagram below/ it is a non-metal, patented material, in Duraseal it is a metal one. This difference is reflected in the price and class segment of the two glass spacers, with Duralite being the only capable of achieving class A of energy efficiency. Yet another advantage of these technologies is the lower sightline of the windows /B/ compared to windows produced with the conventional glass spacer technology /A/.